The Liberian Chief Executive greets a cross-section of young Liberians at the launching ceremony of the President's Young Professionals Program. Monrovia, Liberia - A competitive program, intended to tap the talents of young Liberian professionals has been launched in Monrovia. The President�s Young Professionals Program (PYPP) was launched on August 20 at the Monrovia City Hall, with President Ellen Johnson Sirleaf admonishing participants to take the initiative seriously. 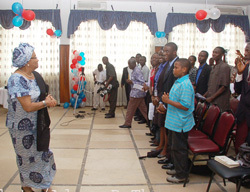 The Liberian leader urged participants to enhance their professional lives for the development of the country. She described the program as an added dimension of national capacity building as its sponsors endeavor to identify, enhance and reward talents. An Executive Mansion release quoting the President said although the program has begun on a lower scale with the selection of fewer beneficiaries, there is room for expansion that could attract more recognition and support from other foundations. The President said Liberia is in need of more trained professionals to succeed the current core of professionals, some of whom now serve the country with support provided by foundations and other capacity building programs, including TOKTEN, Senior Executive Service (SES) and Scott Fellows. The Coordinator of the PYPP, Mr. Saah Charles N-Tow, commended the Liberian leader for her commitment to developing the young talents of the country. Mr. N�Tow said national development can only be sustained when this young critical mass of professional talents is adequately trained to take over from professionals now serving in various sectors of Government. As a start, he said, between eight to ten young professionals would be place in various ministries and agencies to perform a number of responsibilities. Participants, he said, would benefit from the mentorship of a Scott Fellow, SES or TOKTEN employee and report directly to their assigned minister or senior staff member, and will work closely with a designated mentor or on-the-job coach. The initiative was launched by John Snow Incorporated (JSI Liberia), a United States based non-profit organization which collaborates with local partners to assist countries, governments, families and individuals to develop their skills. The organization is working in collaboration with the Civil Service Agency and the Ministry of Planning & Economic Affairs in support of Liberia�s efforts to strengthen its capacity for efficient service delivery. The new initiative is specifically focused on identifying and grooming talented young Liberians for future service in the Government of Liberia. The PYPP is a competitive two-year program for recent Liberian college graduates who have exhibited leadership ability, integrity, and honesty, and are committed to assisting with the reconstruction and development of the �new Liberia.� The program is made possible with support provided by the Hess Foundation of the United States.